A Toolbox Talk is an informal safety meeting that focuses on safety topics related to the specific job, such as workplace hazards and safe work practices. This form is used to record toolbox talks that have happened in the site. From your project page, go to Risk Management tab > View on Toolbox Talk tile. From your projects dashboard, click the Reports button. 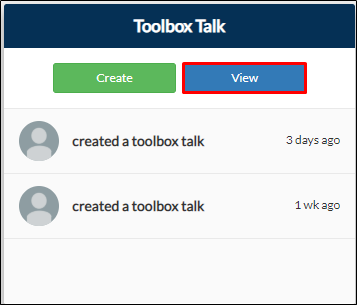 Locate the Toolbox Talk Report then click View Report. This can be found under All or Risk Management tab. 2. You will be redirected to Toolbox Talk Report page where you can view all the submissions. Click View to see the details of the submission. Click Download button to download your submission template. Click Update if you want to apply changes to your submission. Note that when you update your submission, it will be saved as the next version. Click Delete to remove your submission from your report.